Weekly Entertainment Packages from $150-$200 Per Night. 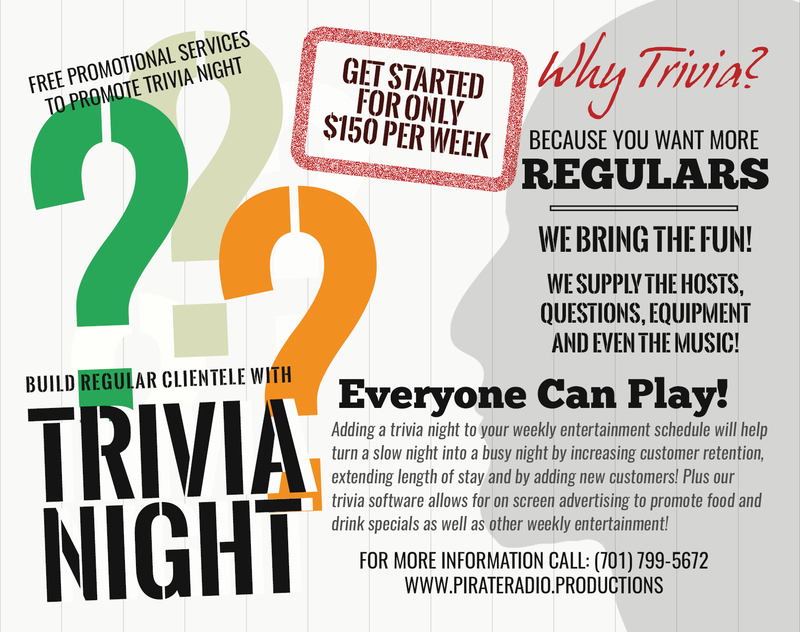 Do you want Trivia at your bar? Then you want Pirate Radio Productions trivia! Our Trivia has variety: Regular questions, themed questions, image rounds, sound rounds. We cover it all! Plus our hosts are fun, professional and knowledgeable! Q: How long does a Trivia Night last? A: Our trivia nights are scheduled to last for two hours. Q: What does on screen advertising mean? A: We use professional trivia software that allows us to not only display questions on TVs but also customize the layout for your establishment. We can add your logo as well as have rotating banner advertising next to the questions. Q: Do you help promote the trivia night? A: Yes we do! Our success is based on your success. We offer: Free Posters & Table Tents for your bar or restaurant. Online advertising through our website, facebook and a network of online event calendars. We even use paid targeted advertising every week on Facebook to make sure your trivia night is showing up on Facebook news feeds across the area.